We are pleased to present the September/October 2017 issue of World Neurology, subsequent to the remarkably successful World Congress of Neurology XXIII held Sept. 16-21 in Kyoto, Japan. 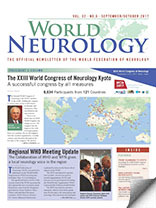 This issue opens with WFN President Professor Raad Shakir’s report from the World Congress. Dr. Wolfgang Grisold and Dr. Lewis also summarize many of the key events from the congress, including some representative photographs from this attendance record-breaking event. To round out the congress reports, this issue also offers an enthusiastic report from one of the many young bursary awardees who participated in the congress. This issue features also reports and images from World Brain Day 2017 from around the globe, with reports from Moldovia; Myanmar; Nagpur, India; and Pakistan. Dr. Grisold also updates us on the outcome of the recent European Board examination as well the World Health Organization meeting that took place in September in Budapest, which the WFN was privileged to take part in. Professor John D. England, editor-in-chief of the Journal of Neurological Sciences, provides his report of the most recent issue of the journal. This issue’s history article, by Dr. Frank Stahnisch, explores the transition from the Kaiser Wilhelm Society to the Max Planck Society. Dr. Prisca-Rolande Bassolé and colleagues update us on their thoughts, from the perspective of young African neurologists, two years after the founding of the African Academy of Neurology. Also from Africa, Drs. Philip Adebayo and Funimola Taiwo report on a novel approach to improve neurologic education in Nigeria. This issue also includes an enthusiastic report from Dr. Vanessa Benjumea-Cuartas from Colombia after her recent Canadian/WFN Department visit at the Montreal Neurologic Institute. You also will find news of the prestigious award recently presented to Dr. Vladimir Hachinksi, past president of the WFN. We hope you enjoy this issue. We are pleased that so many of you were able to attend the recent World Congress in Kyoto. We look forward to seeing you in 2019 in Dubai.